Marble flooring was once thought to be only something you would see in fancy buildings. However, more and more marble is being used in residential applications. Even do it yourselfers are learning quick and easy ways of installing marble flooring as it becomes more affordable and available. For home use it typically comes in tiles either 12 x 12 inches or 12 x 18 inches, and can be installed in much the same way as ceramic tile flooring. Tile nippers - Make sure the blades of your nippers have a good sharp edge on them. A wet saw with a diamond blade - While you can use a straight cutter that scores the tile on ceramic tile, you have to be more careful with marble because it may tend to split along natural fissures in the rock. 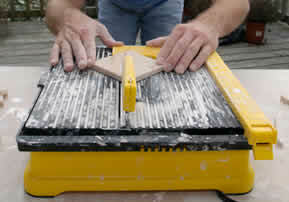 A notched trowel - For spreading thinset adhesive and cement. Squeegee - For spreading cement into cracks. Burlap rag or sponges - For removing excess cement. How To Install Marble Flooring ? Installing marble floors is not all that different from installing ceramic tiles. First, you need to lay out your tiles to determine the proper fit, and cut any marble tiles to fit around corners or in doorways. Second, use your notched trowel to apply a layer of thinset adhesive. Lay your tiles out once more, being careful to set them into place. Use spacers to ensure proper tile separation. Once all your marble flooring is in place, allow it to dry overnight. The final step is to use concrete (rather than the grout used in ceramic tile installation) to fill in the gaps between tiles. Using proper safety equipment is a vital part of learning how to install marble flooring; cement can burn the skin during mixing, so you should always wear long sleeves, a dust mask, and eye protection when preparing cement. Apply with a squeegee, and then wait ten minute before wiping off excess. Washing the surface to remove concrete before it can stain the surface of the flooring is the final step to installing your new marble flooring.